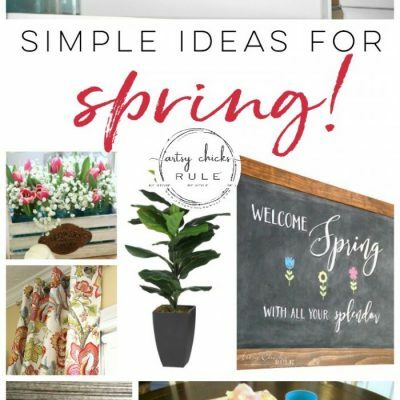 On Tuesday I shared a few spring printables to help bring a little spring into your home. 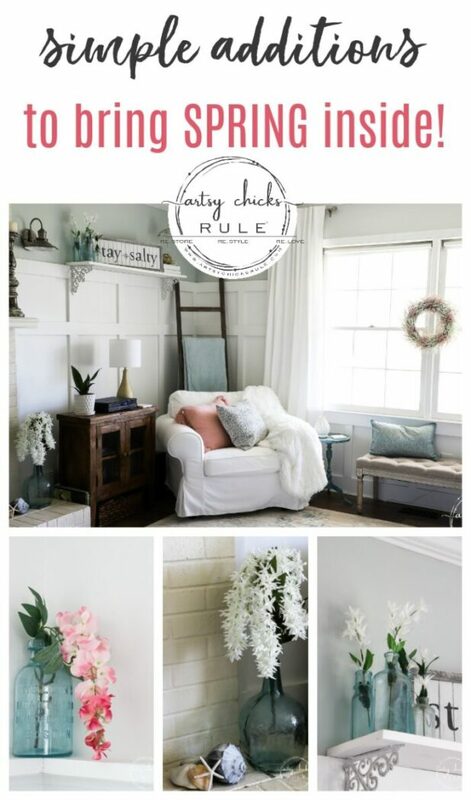 Today I’m sharing even more spring decor ideas! 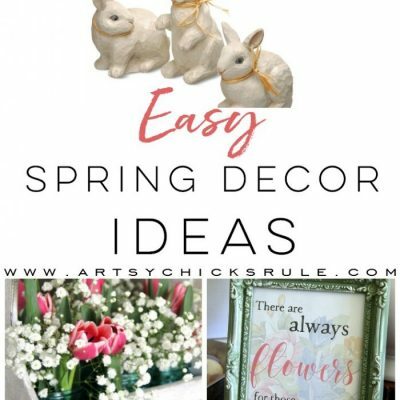 These simple spring decorations are ones that anyone can incorporate into their own home decor. Some are things I’ve made over the years and some are simple florals from At Home and Micheal’s. 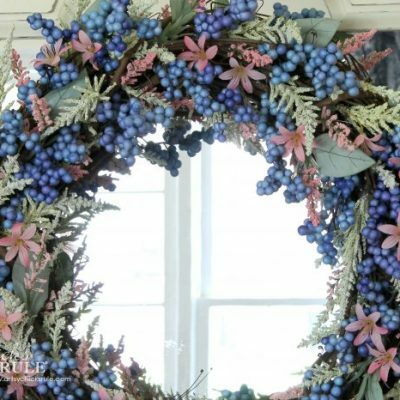 I actually got this wreath at the At Home store a couple months ago. 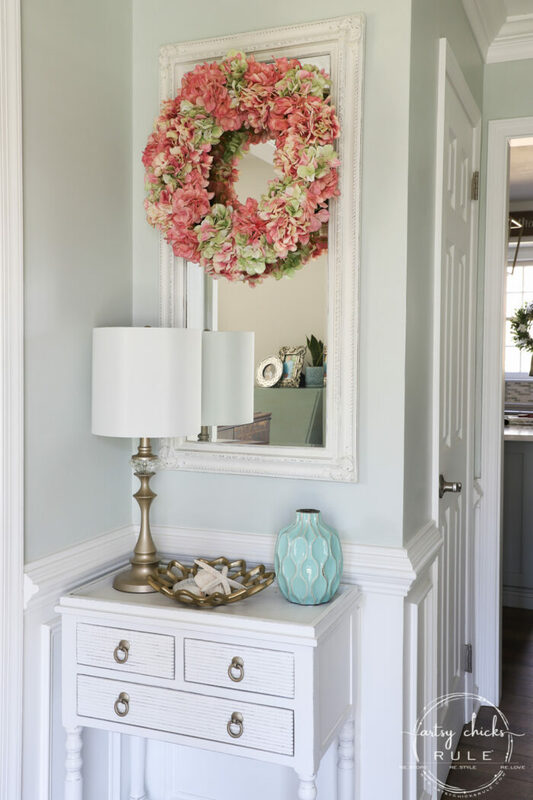 I usually make my own wreaths but I just loved the pink and soft green of this one. So home with me it came! It’s the perfect thing to greet my guests as they enter our home. So springy and happy. To the left of the foyer is our dining room. You might remember I created this simple centerpiece to use over the winter from simple greenery. That blue box is a thrifty find I painted, by the way. You can see it here. 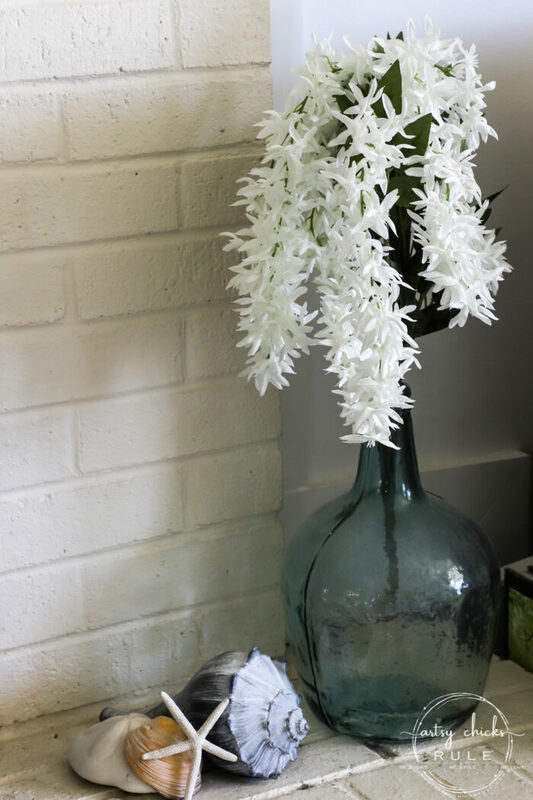 I simply added in some of these pretty white flowers…. 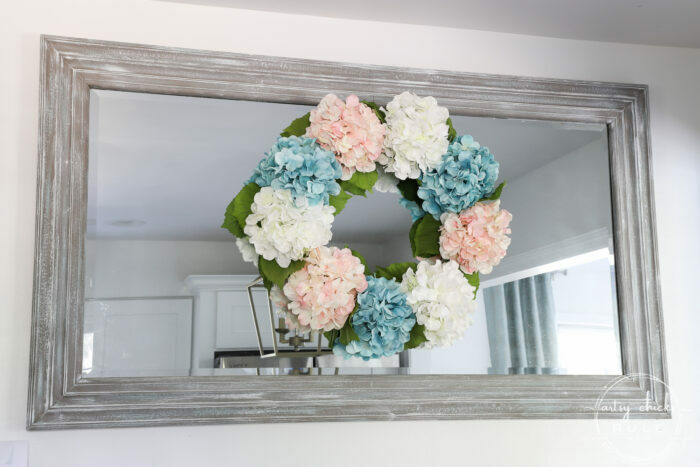 I added one of the spring wreaths I’ve made over the years to the starburst mirror. 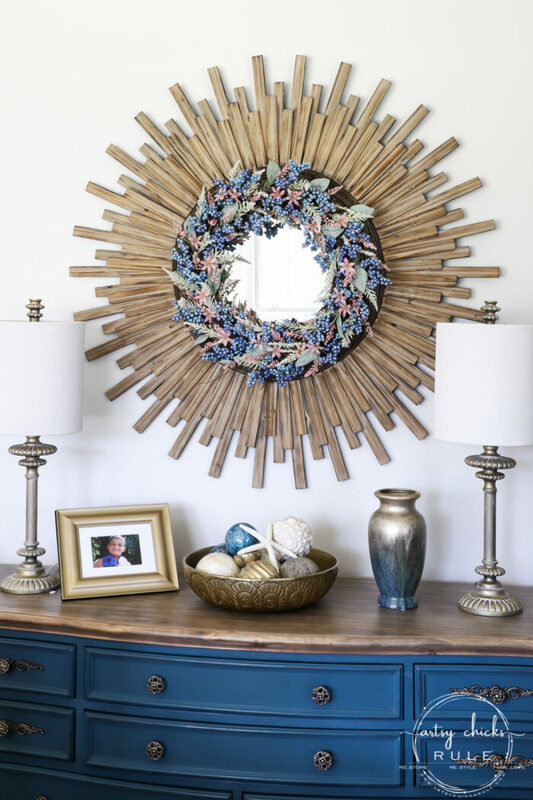 You can read all about how I made this wreath >>> here. 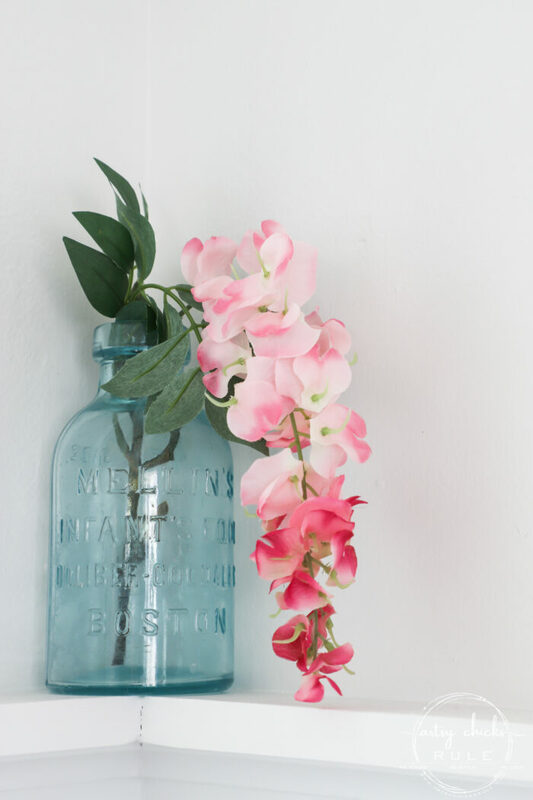 On around the way into our morning room, I added these pink beauties to a jar I had up top. 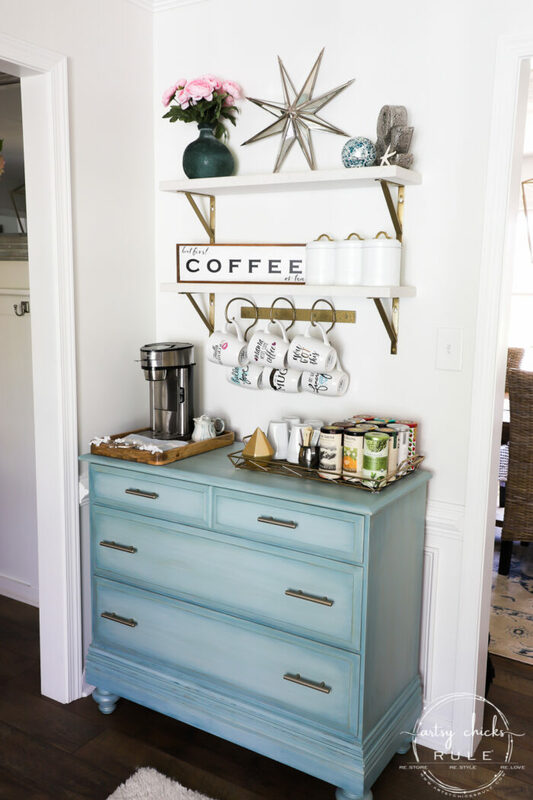 You can read all about this coffee bar and it’s pretty aqua makeover >>> here. Aren’t they so pretty?? They came from At Home. 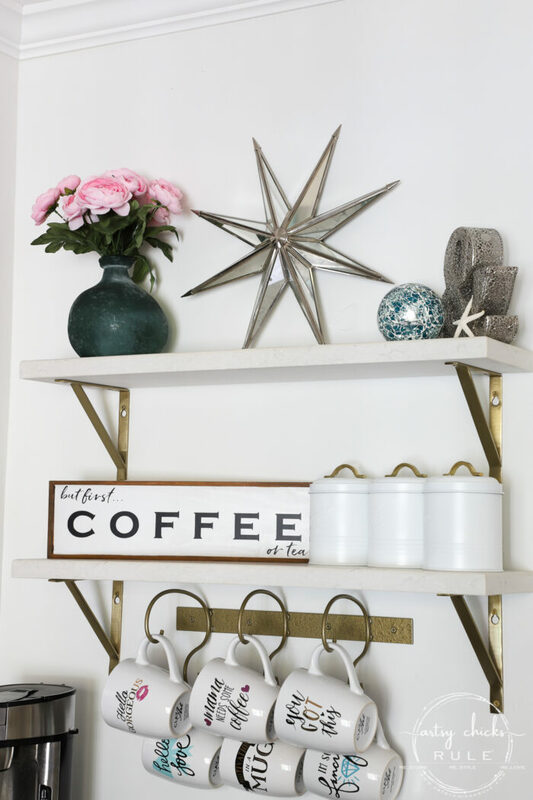 You can find the DIY details on the “coffee” sign >>> here. Here’s some of the greenery (the live kind!) I added here and there…. 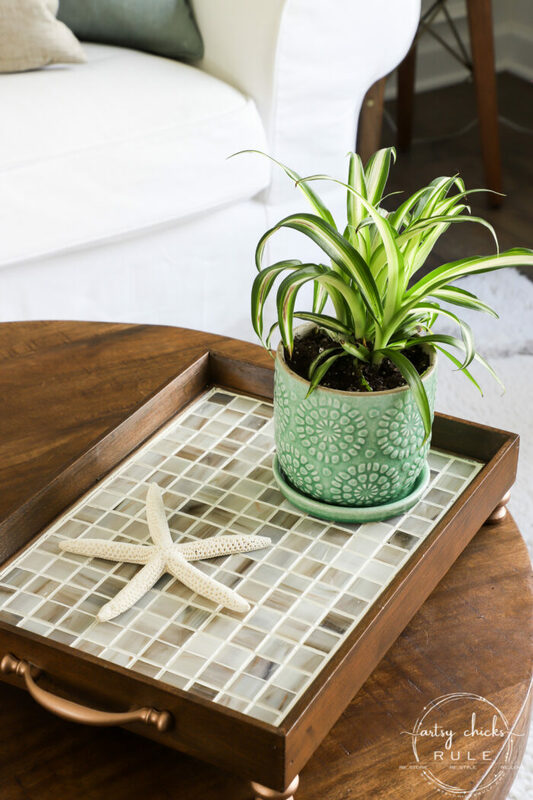 That tiled tray is a recent thrifty makeover of mine, read all about it >>> here. And this one I’ve had for about 12 years! My son actually painted a small pot and planted this for me in 3rd grade. But it needs to be re-potted again, I think. 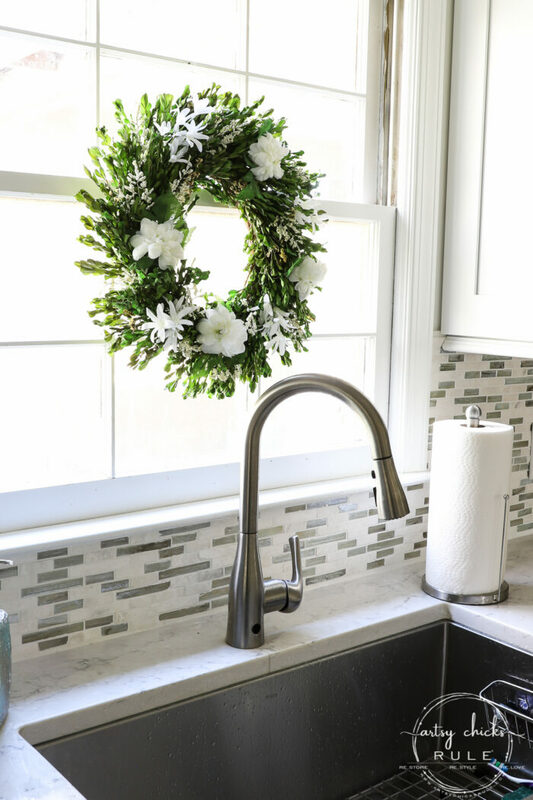 On into our newly remodeled kitchen, I added one of my most popular wreaths here on the blog. 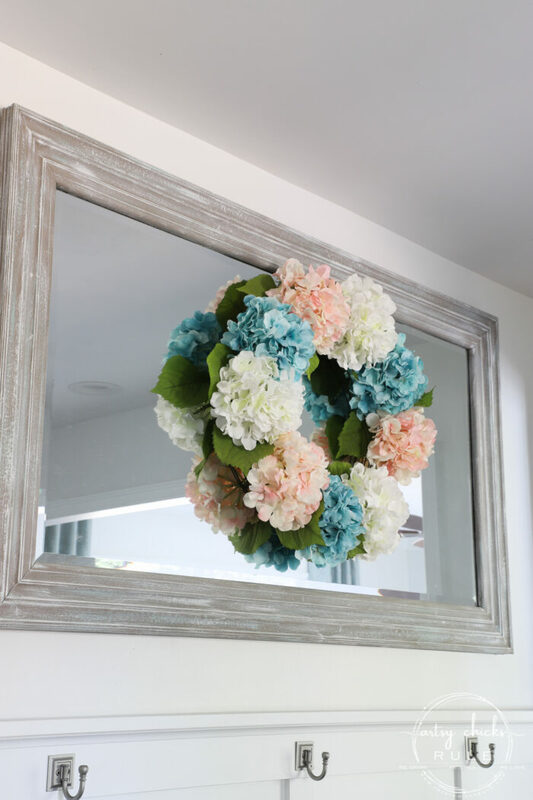 This hydrangea wreath…. you can read all about it >>> here. I have some new plans for this wall in the kitchen. The mirror is coming down. 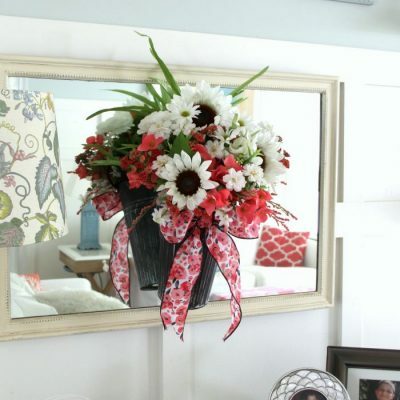 Again, adding simple sprigs of flowers to existing decor is such an easy way to bring spring inside. I just adore old blue bottles like these. I collect them and buy them up every time I see them. 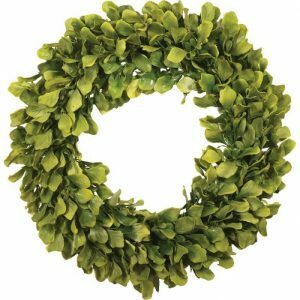 On the other side of the kitchen I’ve had this green boxwood wreath hanging through the winter. I simply stuck in a few white flowers and various white sprigs, here and there. No glue, just stuck in so I can easily pull them right back out when I’m ready. 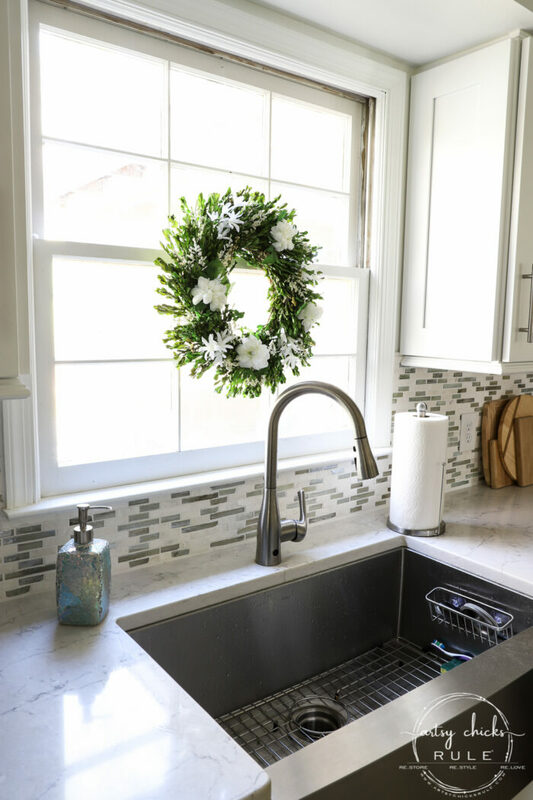 You can read up on the DIY backsplash I did last year >>> here. And that gorgeous quartz countertop in the new kitchen >>> here. 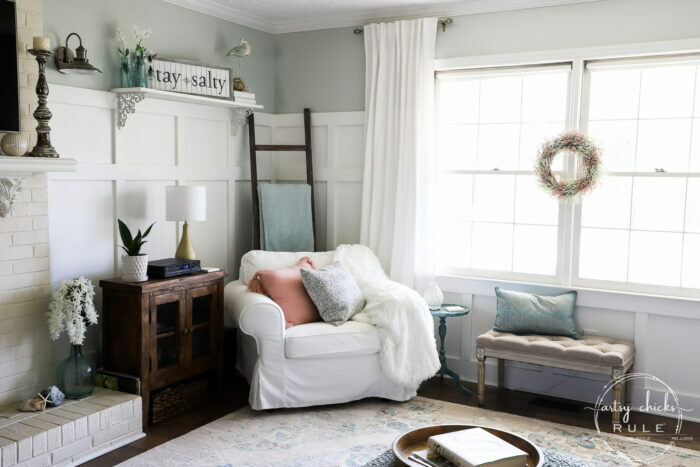 Moving on into the family room…. I added several spring decorations in here. 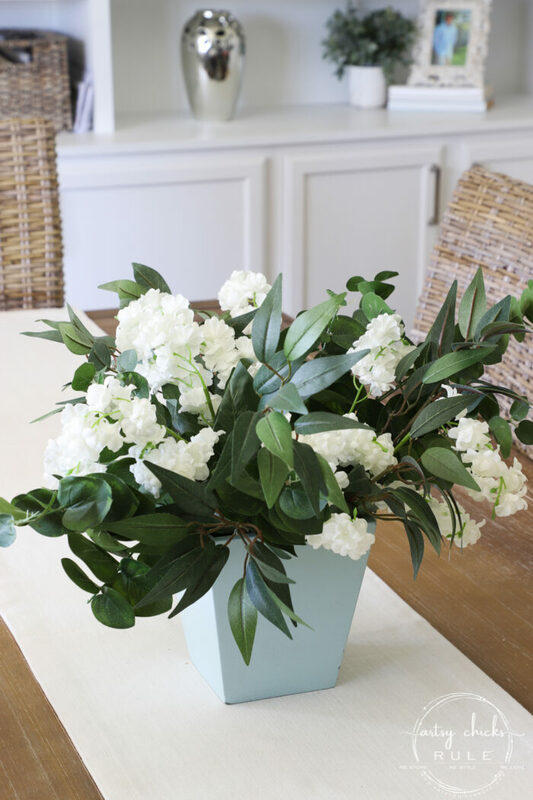 As simple as plopping a stem of these white, flowing florals into a blue jar. 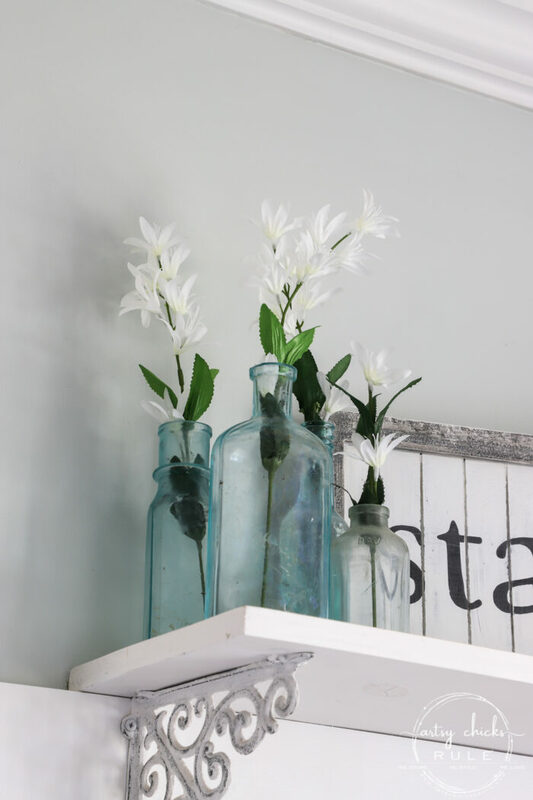 And these little white spring floral sprigs into more of my beloved antique blue jars. Here’s another “live” green plan I’ve added. 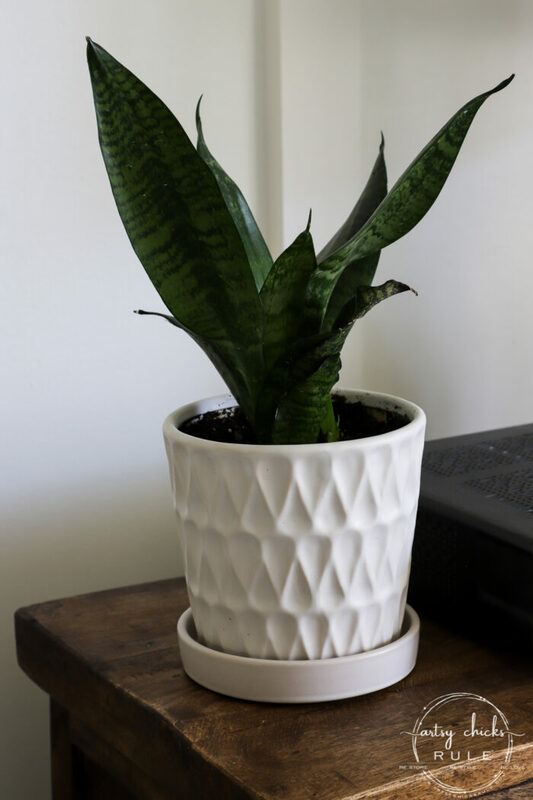 It’s a Snake plant and is not dog safe as it’s mildy toxic. Since it doesn’t really have falling leaves, I’m not too worried about this one. That and the fact that it is not highly toxic, only mildy so. 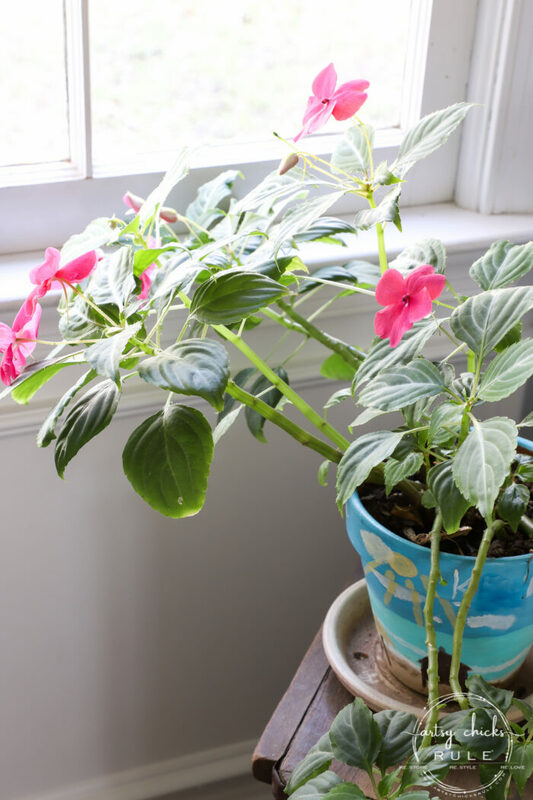 I mean, you guys, there are not that many house plants safe for pets out there! If you know of any I may not have heard of yet, please tell me in the comments below. I really wanted some Fiddle Leaf Figs but they are a big no-no. I’m thinking of adding some Boston Ferns in a couple rooms. They do shed (ugh) but they are pet safe. And a new pink pillow (with tassles, so sweet!) in the chair. I actually wasn’t so sure about the pink pillow in here but it’s growing on me. I also bought a thin pink throw, perfect for spring, and a few more pink pillows but it was a bit too much. One pink pillow is enough. ;) The rest is going back. 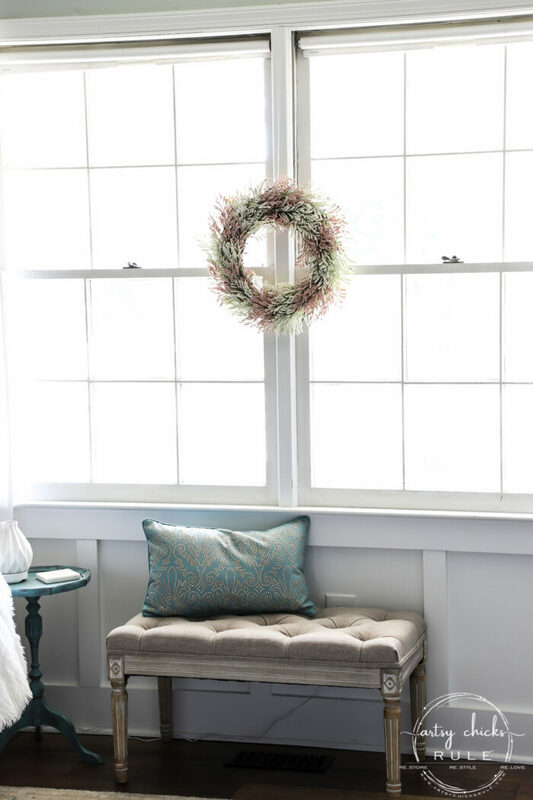 I decided to do something a little different and add this wreath here between the windows. This is one I made a few years ago. 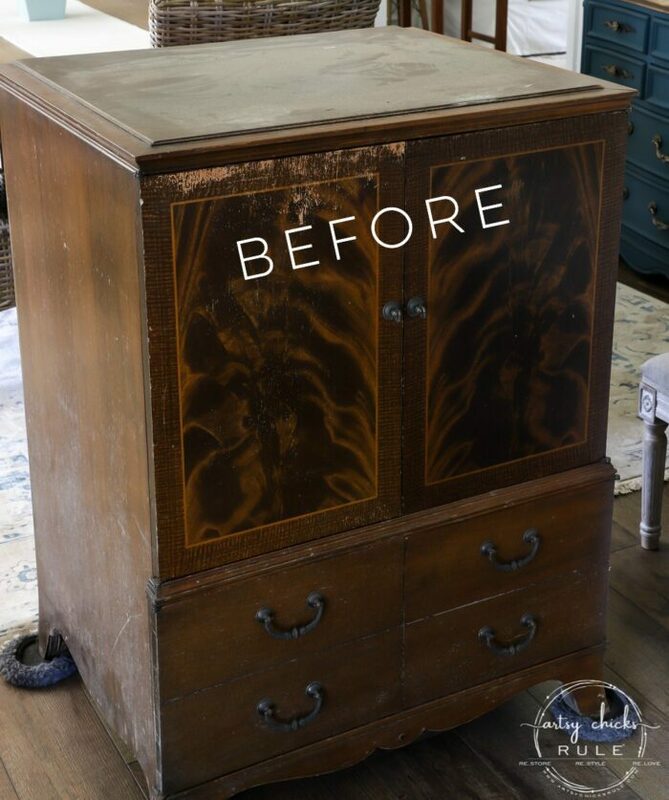 You can read all about how I made it >>> here. The bench can be found >>> here. 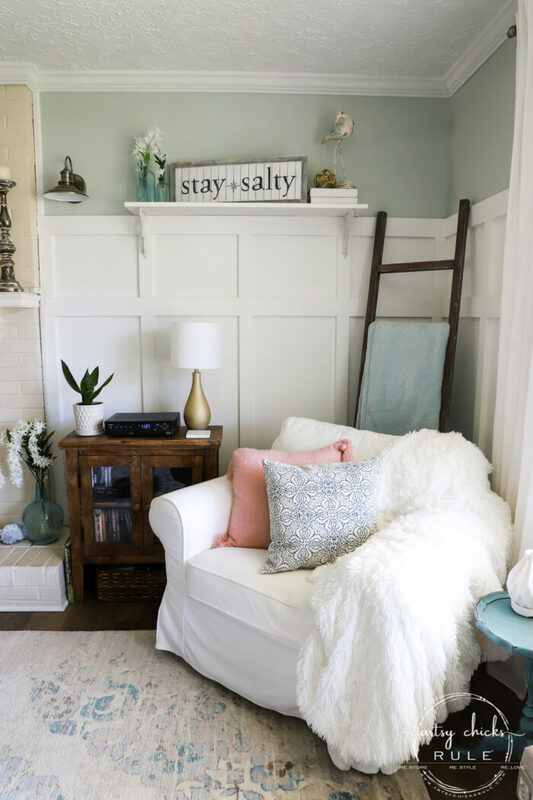 The rug in this room is a steal and can be found >>> here. 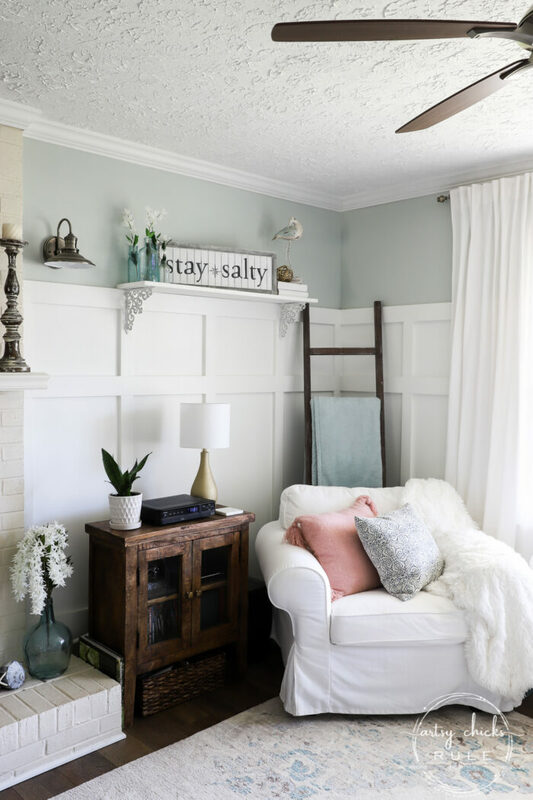 “Stay Salty” sign details can be found >>> here. 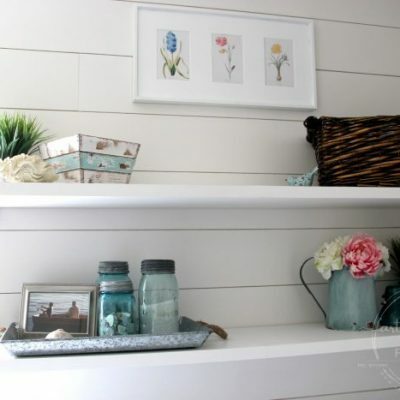 $6 DIY ladder instructions >>> here. 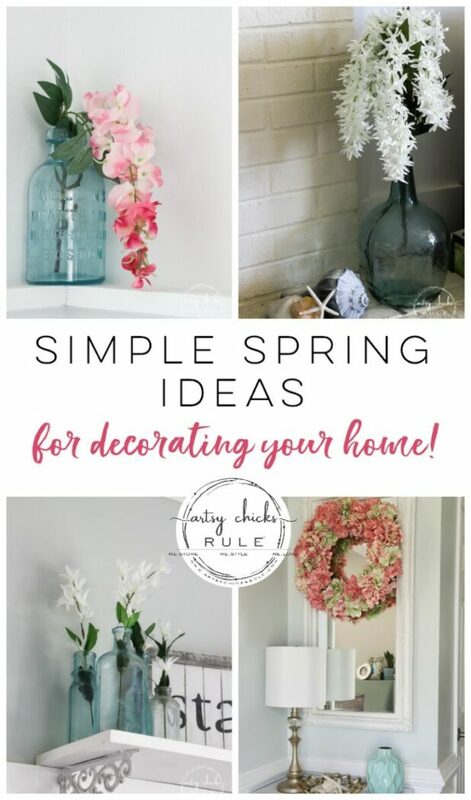 I hope you are inspired to add a few simple spring decorations to your home, too! Our stairs…what to do,what to do? Paint, runner? Stay tuned. The wall in the kitchen. Mirror down, new stuff up. I can not lie, it’s not fun right now. But it will be once we are putting it back together. Hop on over to my INSTAGRAM account and check out my stories. I’m sharing there as we go so follow along to keep up with all the behind the scenes action. Here’s what I’ll be working on this weekend….. (besides the bathroom)…I might share a snippet or two of it this weekend too! It’s an old tv cabinet that I’m turning into a bar cabinet. Maybe I’ll get it done for next week?? Maybe! Hi Nancy! I love your blog — it’s a regular read for me. I’m always interested in the ways you transfer text and images to other surfaces. I recently found another way I thought I’d share with you and your readers. I wanted a quote on the inside of my pantry door: Love and cook with wild abandon. First, I designed the text in PowerPoint until I got the font styles and sizes of all the words just right. I had to print it on several sheets of paper. I pieced them together to get the word placement right, taped it in place at top only (making sure everything was level), stuck carbon paper behind it, and traced everything with a pencil. I removed the paper, and used a very fine artist brush to go over everything with dark semigloss paint I already had (matches my kitchen decor). It sounds like a long, tedious task, but once the computer part was done, it took less than an hour. Super easy! I love it. It came out so cute. Carolyn, your carbon paper idea is a good one! I don’t have a steady hand and every time I saw someone free hand drawing, I thought to myself, I would just make a big mess of that. I, too, am a regular reader of Nancy’s blog. LOVE almost everything she does. Great tip! Thanks, Carolyn. Where can you find carbon paper anymore? I bet generation X has never heard of it!! Much less a mimeograph! And thank you for sharing that! I bet it looks absolutely great! 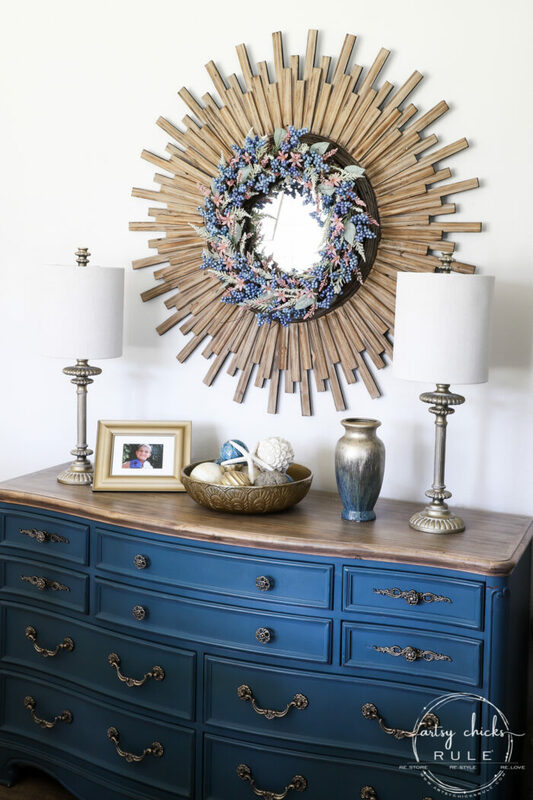 Isn’t it so much fun to make and create these kinds of things for your home? Nancy, I have the same pet/plant problem as you except I have cats…who climb on things… to get at plants. You may consider hanging plants since I doubt your dog would jump up to get at them. So lovely! 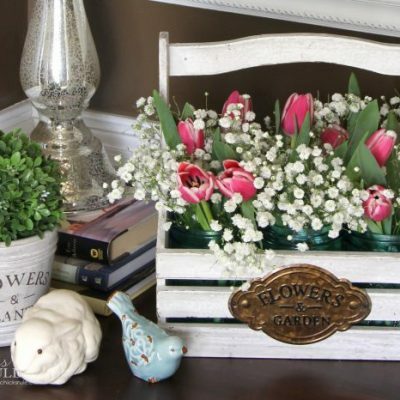 Spring is by far my favorite time of the year and I love how you have made your home so warm and welcoming with all the flowers and soft colors. Your spring home looks lovely, Nancy! I’m so excited that we have our first At Home in So Cal opening near me (I’ll have to drive 1/2 to get there, but that’s okay… sister-day-date!) I love the flowers flowing over the demi-johns and jars! And I’ve always loved your wreaths!